So, the other day our office got burglarized. Someone threw a rock through the window and stole a bunch of hardware, including my laptop. So, work offered to get me a replacement machine. Went to the store, and the only models that had the upgraded RAM also had the higher end video card and HD, so ended up getting one of the faster models. Not a fan of the keyboard. The travel is too low, and I find I'm making a ton of typing errors that I didn't used to. I'm hoping as I get used to the new keyboard this will fade as an issue. The power brick came with just the 2 prong adaptor instead of the grounded, 3 prong, longer version. Seems kind of stupid/cheap to skimp on, but I had a bunch of 3 prongs floating around so fixed that quickly enough. Ended up dropping almost $200 on stupid dongles and adaptors in order to connect my laptop to the various items I need to connect it to. The most useful of which is probably the belkin connector with HDMI, USB (old school) and another USBC port on it. that might be enough to keep me from losing my mind. Battery life is pretty pathetic so far. Not sure what all I was expecting but I wanted to put it through it's paces to see how it would perform. Fired up Civ 6, figuring that's about as CPU/GPU intensive as I can get. Laptop ran approx. 45 min. to an hour and then was 100% dead. I'll have to repeat this test as it seems short, even under heavy load. I haven't had a chance to just walk around with the laptop to test battery life, but should over the course of this week. The screen is great, and I like the resized track pad. I really like the touch ID in order to install etc. items on the machine. I hadn't realized how often I was having to type in an admin password until I didn't have to any more, and that has been nice. The unit I have after 24 hours has started to make a consistent, low grinding sound from the fan, even when the machine is under 2% load or less. That worries me. Looking online it seems to be a somewhat common issue. For every day use, this machine feels exactly the same as the 2013 model that I had been using. I haven't noticed any significant speed increases over what was there before. This machine still beachballs pretty regularly when trying to do basic office tasks, either local machine based or network based. This is probably the first time I've gotten a new Mac and it hasn't seemed significantly faster than my older hardware. This is a totally pristine install too, since my laptop was stolen and I'm still working on the cloud restore, I've only added a handful of programs to this machine's default config. I'd have been happy with the machine at about half the price. As it stands, the jury is still out as to whether or not I want to keep using this machine or sell it to someone and go back to the previous model. Last edited by alcimedes : 2017-01-10 at 11:20. Ugh. And I was trying to convince myself to upgrade my 2010 17" MBP. Maybe I will be able to when the 2017 edition comes out. Better battery life isn't a huge issue for me, though I don't want only 1 hour when plying Minecraft in the car while waiting for my kids to get out of X activity. Just read the review posted in the 13" MBP thread, it's pretty much exactly how I feel. First time I'm seriously considering returning a product of theirs. Arrived at work this morning around 8:15 or so. Machine had been charged to 100% before leaving work the day before. Didn't use it at all last night. It's now been approximately an hour, and the battery is down to 80%. At 20% per hour just doing online tasks, some document editing, etc., and then sitting idle most of the time, it's dropping about 10% every 30 min. That's worse than my previous laptop doing literally these exact same activities, and that machines battery was 4 years old at this point. I'm pushing video to one external monitor, that's it. CPU usage has been parked under 5% this entire time. Would be interested to know if other people are noticing similar battery life on their machines, or if this particular model has issues. Blutooth is on, but not connected to anything. The wifi is off, and data is going over a USB C to enet converter. Zero other items plugged into the machine. Screen set to go to sleep after 10 min. of no use. Screen brightness is at approx 50% - 60%. It's now been approximately an hour, and the battery is down to 80%. It's now been 1.5 hours, battery is down to 60%. At 2 hours in, battery is at 40%. 2.5 hours in, battery down to 20%. Just under 3 hours at this point, and the battery died. So, I'm getting a whopping 3 hours of battery life being online, working in Word, printing documents, and entering data. No processing, compiling, video editing, gaming, no Wifi, 50% brightness, and three hours of battery life. The only thing I might be able to change would be to work with even lower brightness. Not sure how much of a difference that would make given how quickly this thing ran out of power though. Last edited by alcimedes : 2017-01-10 at 13:50. Apple is prepping a software update that is supposed to fix the issue. Interesting. I've been using Chrome so far as it's more reliable in our CMS, so the power issues I'm having wouldn't be affected by the Safari patch they're describing, right? I have an appointment this weekend at the Genius bar, I might just have them take the machine back and get a maxed out version of their last laptop. I would venture to say Apple uses Safari at the core of many things that display on your computer. I haven't mapped it out, but I bet that's what displays pages in iTunes and App Store etc. Also, isn't Chrome a battery hog too? I haven't mapped it out, but I bet that's what displays pages in iTunes and App Store etc. Also, isn't Chrome a battery hog too? You may be correct about Safari existing in other, hidden places. For my testing though, I'm just doing my typical work. Today that means I have Word, Excel, Chrome, Messages and Mail.app open, and that's it. I haven't fired up iTunes, App Store etc. If I'm not actively using it for work today, I haven't opened it. I wanted to give it the best potential outcome I could. I have all java scripting and flash disabled on all pages in Chrome via extensions in the browser, those are your typical power hogs. I only have three tabs open, AI, reddit and our CMS page. No ads on any of them. I've been mapping the CPU usage in that time frame, it rarely ticks above 5% and when it does it's a quick blip to 10% or so then back to normal for another 5 min. or so. I'm at a loss to explain what's using up the power. 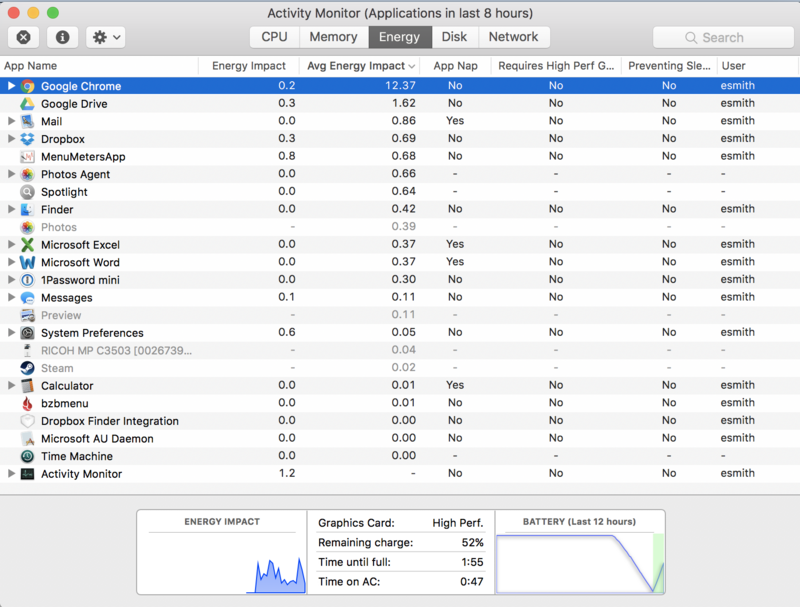 Checking out Activity Monitor, you can see that Chrome is my highest energy item, but I don't really know what those numbers actually mean. Maybe I should try a second test using Safari only see how that compares. Wow, well I'm terrified. I mentioned before I ordered the last gen Macbook Pro 15 because of concerns. Then on New Years Eve, BHPhoto offered the new MBP 15 16/500/Radeon Pro 455 for $2379 or something like that and I had them ship it out. I haven't opened either yet because my other Macbook Pro actually runs just fine and I was hoping this stuff would sort out one way or another so I could decide on one and return the other. I've got them both on a credit card with no other balance and a widely extended return window due to the holidays. Please keep me in the loop so I can figure out which to use and which to return. At a minimum I am still leaning towards the 2015 as it is a known problem-free solution but how sad is that really to be stuck in such a tight spot. It looks like you are using the discreet graphics from that screenshot. I wonder if you can install something like I did with the gfxStatus and force integrated graphics. It's set to auto switch now. When it's not plugged in I believe it's defaulting to the integrated card, once I plugged it in it went back to the discreet card. If the answer is "the new laptop can't handle using Chrome" that's going to be an issue, as Chrome is the only browser that functions properly in a variety of online tools I need to use for work. I think it is "the new laptop can't handle using Chrome unless it's plugged in"
This is my biggest beef with Apple's quest for smaller. Like I mentioned in the other thread, they give up function over form. I don't care who has the smallest laptop, I want the BEST laptop. They are not putting out the best right now IMO. Chrome does activate the dGPU. I've noticed that for a while. I don't know what makes an app decide to use it but Spotify does as well. If you have gfxCardStatus installed, it will tell you which apps are hitting the dGPU. So I quit chrome, and let the laptop charge back up to 100% over lunch. Unplugged the power about 30 min. ago. I actually haven't even been at my desk on this computer more than 10 min. since then, as I've been running around between offices working on other projects. The machine had powered off the screen etc. like it was supposed to, yet when I just woke it up from sleep right now, it's already down to 80% after 30 minutes of being unplugged. I'm going to reboot, and then not fire up Chrome at all and see if I can get the discreet graphics things to switch back to integrated. If the video card is kicking in while using Mail, Office apps, or Safari I'm pretty much screwed short of disabling it with gfxCardStatus or the like. also, has anyone else noticed that there's a weird keyboard lag or something when you're going to first log in? in the normal "enter password to log in" screen when you first reboot, I have gotten the password wrong EVERY SINGLE TIME the first time I type it in. I can see from the little dots representing the password that it's short multiple characters, but entering it again the exact same way 2 seconds later always works fine. And it looks like Activity Monitor is predicting I'll run out of power in 2 hours on the dot, exactly the same 3 hours I got running Chrome and doing essentially nothing else. Last edited by alcimedes : 2017-01-10 at 16:18. This CR story continues to be so bizarre. I guess CR thought they were being clever in their benchmarking by disabling caches? You have a lot of activities that add up to a 'substantial' drain... Is the battery lower total Wh than previous batteries? I wonder if it's the discreet video card that's to blame. I'd have thought the integrated graphics would be enough to push an external monitor, but maybe that's the entire difference? That would seem laughable though, to go from 10+ hours of estimated time to 3 hours because the discreet video card is pushing essentially the same video. I do know that the previous models had over 8,400+ mAh, where as the current 15" model is approx 6,700 mAh, so right off the bat you're talking about a 20% difference in total energy before anything else is even taken into account. I would be hard pressed to use a computer and have it doing anything less than what this machine is choking on now. As it stands, the battery shows it's going to be fully discharged in 35 minutes, which would give the Safari test a slightly lower score of 2:45 min. instead of 3:00 before it runs out of juice. And at 3:40 PM, right on schedule the laptop is out of power and has to be plugged in. Difference between Chrome as Safari, Chrome +15 min. I'm still disappointed by approximately 200% from the listed 10+ hours of battery time;. Last edited by alcimedes : 2017-01-10 at 17:41. Is the battery lower total Wh than previous batteries? So a sizeable capacity increase with the retina models, then more or less a move back to unibody levels. I think there is a Touch Bar initialization thing going on. The new systems have faster flash, but seem to boot slower, and the only thing I can sort out is the Touch Bar/Touch ID business. Not sure what that means, really, but it's the only major difference that makes sense. Supposedly, the guts of the 2016 models are more efficient, so they should get the same battery performance. I am convinced this is a software issue. I don't think the hardware is the problem. Somewhere, down in OS X's guts, the power management is greatly askew, and I bet Apple's engineers are hard at work trying to identify/fix the issue. The keyboard it still annoying five days in. I'm having a hard time typing with any efficiency. I'd have presumed the shorter travel would make it easier to know that you've hit the keys, but some how it's the opposite with this keyboard. I'm either hitting keys without realizing it while my fingers are resting in their normal locations, other times it's not registering what I think it would with a relatively light press. I have to type with about 1/3 the typical 'force' I guess you'd say in order to be 85% as fast as I used to be. But if I start really typing out as quickly as I'm thinking, mistakes galore. I suppose I can get an external keyboard, but another reason the previous model is looking more and more tempting. I'm very used to that keyboard and found it to be a great balance between travel/effort required and haptic feedback to know you've hit a key. I also wish that if you turned off Siri in the OS, it would remove Siri from the Touchbar. About 1/5th of the time when I go to hit the fingerprint scanner it registers a touch on the Siri button asking me AGAIN if I want to enable it. I've said no 41 times in a row, at what point will you take the hint and presume I haven't changed my mind on the 42nd time, and that while the password prompt is up, IGNORE the Siri button. Again, this machine feels like something that was developed at the Apple campus, and never exposed to any real work flow before heading out the door. Why not just put something else like Do Not Disturb in the Control Strip? The Touch Bar is not customizable at that level. This is the input's greatest weakness. Its customizability should go far beyond what Apple imagines (and perhaps will as time goes by). I have very little use for Siri. Al's issue hinges on the fact that it cannot be got rid of. If you can tell me how to remove Siri from the touchbar (other than setting to to the f1 - f12 or the standard interface) I'd love to know. Ok, just figured out how to do this. Didn't realize before the mouse cursor would travel to the touchbar in order to remove an item on there I didn't want. System prefs, keyboard, Customize control strip. From there, mouse down off your screen to the Siri button in the control bar. When your invisible cursor is over it, the button will highlight. Drag it up off the Control Strip and it will be removed similar to removing a Dock item. Thanks Bobsky, that's super, super helpful to know I can remove it! I had found info on customizing within an app, but didn't realize I could do the same to the default set. I just replaced the "Siri" button with a "Show Desktop" button instead. The Control Strip just became way less annoying and way more useful. Customize Touch Bar… is about the app-specific items, and Customize Control Strip… is what can also be found in System Preferences. This customization was shown in the keynote, so I figured it was common knowledge among AN regulars. I've stopped watching the keynotes for a while now. I did know about the in-app customization, but even that is sadly limited. For example, in Mail.app, I have about 5 folders that 90% of my emails end up going into after they've been handled. You can customize the touch bar in mail, except that your options are pretty limited. I had hoped I'd be able to add specific mail folders to the bar. Except my only "folder" related option is to "move to predicted folder" only the 'predicted' folder isn't predicted for crap, it's just "last folder used, or first alpha numeric in the list the first time up" . The predicted folders aren't even specific to the email account the message is tied to. My @mac.com address shows me the first three folders of my work account for example. If nothing else it should show me the first three folders related to the account in question, not some totally separate IMAP account and folder structure. Simple stuff like being able to set the folders that appear would make the touch bar SOOOO much more useful, but from what I can tell the capability isn't there in the current revision. Seems like one of those things people using the hardware on a daily basis would have brought up as a very, very useful feature. The control bar is cool, but feels like it wasn't really usability tested, or if it was they didn't follow the bulk of the feedback they would have received from real world users. It absolutely is … and Customize Control Strip… is what can also be found in System Preferences. System Preferences - Keyboard - Customize Control Strip. I had to hunt around for it, but I stand corrected. You can eliminate the Siri button altogether. Yay! Eh, I dunno. It's a 1.0. iOS's Mail couldn't even flag messages until 5.0! Like, at all! That's a pretty amazing limitation in retrospect. I'm less concerned about how certain useful buttons will eventually get added and more concerned about how good of a control a Touch Bar button is anyway. It's less tactile than a physical key, to be sure. I'd much rather see Apple and third parties explore controls like scrubbers and sliders that take more advantage of visualization and gestures, things that are simply entirely impossible with physical keys. Buttons? Might as well assign, like, F5 to that. And I selected a message. And I tapped my new button. And the message got moved. Tada. It's a hack, but it's a start, I guess? *) Though, increasingly, I run into trying to upgrade a Windows app to better support high-DPI, and virtualizing that does invariably make the fans go screech. It's about the only thing that does… performance is still good for pretty much everything else. **) I simulate this using Touché, to get a rough sense.